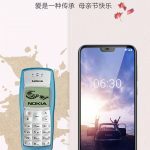 Nokia Mobile posted on its official Weibo account in China two teasers for the upcoming Nokia X announcement. In fact, Nokia Mobile’s Weibo feed is quite interesting. 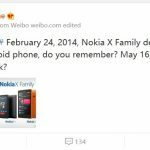 In one post they are mentioning the Nokia X family of devices that were announced in 2014, saying that Nokia X is coming back on 16th May. 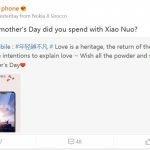 Other posts include photos of the Nokia X, with one made for Mother’s Day where the X is alongside the iconic Nokia 1100. The two posted teaser are counting down till 16th May. 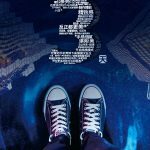 On the teaser posted yesterday, we have the number 3 made up with a lot of words in Chinese, but below we find out the exact time of the announcement, which is 15:30 local time, or 9:30 CET. 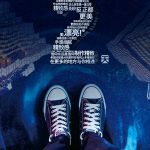 The teaser posted today has the number 2 written with different Chinese words. Check them down below. LoveNokia.net took a closer look to the words making up the number 3 and they found out that among them was “ZEISS”, which could indicate that Nokia X6, or a member of Nokia X family, could feature ZEISS optics. We didn’t see the ZEISS logo neither on TENAA, nor on live photos from China. We still don’t know how many devices HMD plans to announce under the Nokia X brand. Until now, we heard about the Nokia TA-1099 and TA-1109 that should come with similar specifications (that you can check here) and looks, but different processors – Snapdragon 636 vs MediaTek P60. It’s good that the announcement is relatively soon (in just 2 days), and we will finally officially know everything about the first Nokia device with the notch.